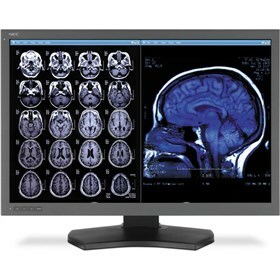 The NEC MD302C6 is a 30" LED backlit IPS diagnostic monitor from NEC that uses IPS screen technology to provides wide viewing angles and color clarity to meet the demand of healthcare professionals requiring consistent and accurate medical imaging. This monitor can support resolutions up to 3280 x 2048 and can produce 16.7 million colors. It senses the amount of light in the room with an integrated sensor and can adjust the brightness level up to 800 cd/m² to display images clearly. The MD302C6 features the GammaComp MD QA software to ensure consistent image quality and provides 16-bit lookup tables to enable precise calibration. This monitor has a contrast ratio of 1000:1, a response time of 15 ms, and can be viewed from the sides up to 170°. The LED includes a power cord, DVI, DisplayPort, and USB cables. The NEC MD302C6 has many exciting features for users of all types. See the NEC MD302C6 gallery images above for more product views. The NEC MD302C6 is sold as a Brand New Unopened Item.